You might imagine that gingivitis (gum disease) is a problem suffered by children and adults, but infants can also suffer. Even though teeth do not usually appear until between six and twelve months, if you notice red, inflamed gums which might be accompanied by bleeding, it is probably gum disease which can be confirmed by a dentist. 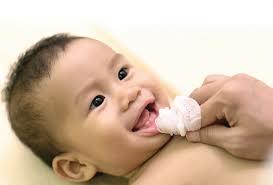 – Cleaning the gums after feeding with a soft, damp cloth. – Using a toothbrush and a tiny dot of toothpaste when a tooth appears. – Flossing when teeth have grown to touch each other.